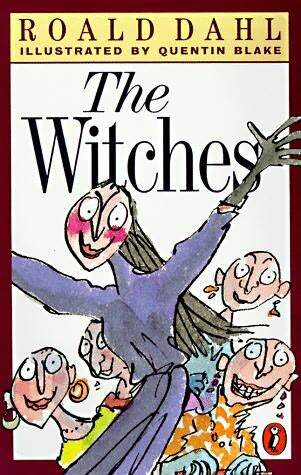 Warning: This book and review may be offensive to actual real life witches, since it portrays them as bald, toeless child killers. The boy who's telling the story goes to live with his grandma when his parents die, and she teaches him all about witches. Witches hate children, and their lives are focused on killing as many children as possible. His grandma tries to keep him safe by teaching him how to identify witches (by their baldness, lack of toes, etc. ), but one day he comes across the Grand High Witch herself, and it'll take some pretty clever tricks, and some luck, to escape her. This one's a bit more disturbing than some of Roald Dahl's other popular kids' books like Matilda and Charlie and the Chocolate Factory, but it's still an enjoyable story. I love how creative the details are about how to identify a witch, like that they have blue spit, and slightly larger nostrils than normal. Regular readers of this blog will have heard me gush about Quentin Blake's illustrations before. They're so delightful (just look at that cover! ), and really bring the story to life.